A series of Vertical Scrolling Shooter games made by Compile. 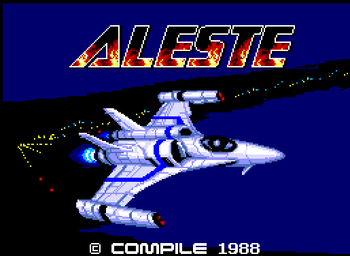 Most of the Aleste games received North American and/or European release but were renamed to hide the connection. Defeat Equals Explosion: As usual for the genre, defeated enemies immediately turn into neat fireballs. Flash of Pain: The protagonist's spacecraft often flashes white when hit. Spread Shot: Present from the original Aleste onwards, where some enemies fired a dozen-bullet spread that eventually reached both edges of the screen.